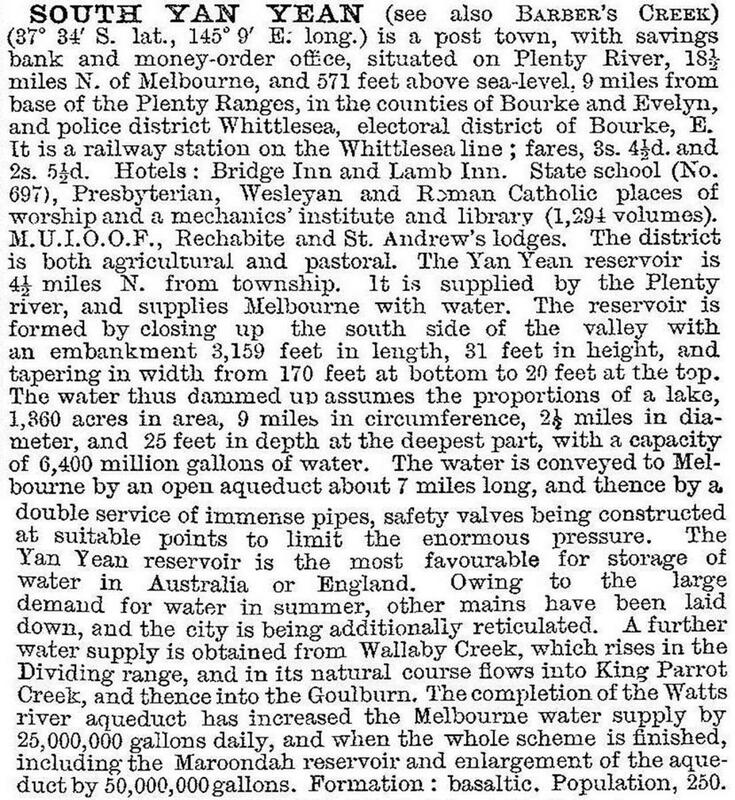 Yan Yean, best known for its domestic water reservoir, is on the Plenty River 30 km north of Melbourne. According to Bunce's Language of the Aborigines of the Colony of Victoria (1859) Yan Yean is an Aboriginal word for bachelor, boy or unmarried (Yan Yean is recorded as an initiation place). The location of the reservoir was a swamp, and Yan Yean was known as Ryder's Swamp until the 1850s. European settlement of the Yan Yean district began in 1839, and most of the land was occupied by pastoralists by the mid-1840s. One of the best known pastoralists was John Bear, whose workers constructed a two storey Gothic inspired building of mud and masonry which came to be known as Bear's castle (1848). It is within the Yan Yean water catchment and is on the Register of the National Estate. In 1850 the Melbourne City Council directed its surveyor, James Blackburn, to investigate an improved supply of water. He chose the Plenty River. Subsequently the colonial government took over Blackburn's proposal, and decided to use the natural basin, Ryder's Swamp, east of the river for a reservoir. It was fed by streams flowing off the impervious range south of Mount Disappointment. Upwards of 1000 people were at Yan Yean during the construction works, which were completed in 1857. Yan Yean cemetery began in 1853 with the death of a worker. A primary school was opened in 1858, a short-lived post office began the following year and church services began. When the post office reopened in 1876 it was known as Barbers Creek, a stream that crosses Plenty Road before joining the Plenty River. Barbers Creek is bridged by an early Monier concrete bridge (1901) built by Monash and Anderson. Travelling north, a motorist can cross the old railway reservation into Old Plenty Road, where there are an Avenue of Honour, the former school and post office and the heritage listed Craigie Lee farm house (c1855). Dairying occurred from the 1920s until the 1970s, alongside sheep and beef cattle. As metropolitan Melbourne has edged towards Yan Yean poultry, horse and dog breeding have developed, but cattle grazing is dominant. Many farmers depend on supplementary non-farm income. The township has almost disappeared. The post office/store closed in about 1974 and the school closed in 2002.